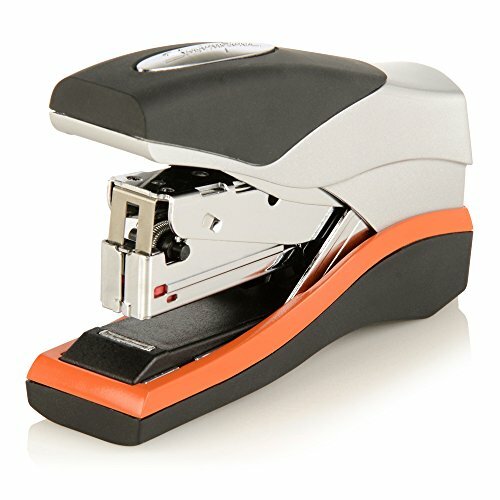 With a black-and-silver plastic housing to protect the metal stapling mechanism, the Optima 40 compact stapler is built to give you long-lasting, reliable stapling. This stapler holds a half strip of 105 staples. Compact design fits perfectly on smaller desks. A helpful low-staple indicator lets you know when it's time for a refill. Optima fastens up to 40 sheets of paper, which is nearly twice the sheet capacity of standard staplers. Works best with Swingline Optima Premium or S.F. 3 Premium staples, with standard ¼” length legs. The Optima 40 design requires less force than traditional staplers, so you can save your muscle for something that matters. Soft, ergonomic grip ensures comfortable stapling. Quiet stapler is designed to be less disruptive in offices and classrooms. Tasteful black and silver coloring with orange accents. Swingline stands behind this high quality stapler with a limited lifetime warranty.